The Bill Emerson Memorial Bridge in Cape Girardeau, Mo., was used as a case study for a novel Wireless Cyber-Physical Simulator developed by Chenyang Lu, PhD, and collaborators. (Phys.org) —Structural control systems have the potential to help our civil infrastructure, such as bridges, roads and buildings, withstand natural disasters such as earthquakes or storms. However, traditional control systems based on sensors connected by wired networks are costly, labor-intensive and tend to break during disasters, when they are needed most. Recently, engineers have begun to use wireless networks that are easier, cheaper and more resilient to structural damage, such as that wrought by earthquakes or hurricanes, as they are able to reroute data to still provide it at critical times. Chenyang Lu, PhD, professor of computer science and engineering in the School of Engineering & Applied Science at Washington University in St. Louis, teamed with colleagues at Purdue University and the University of Illinois at Urbana-Champaign to develop a unique system they call a Wireless Cyber-Physical Simulator, a state-of-the-art, integrated environment that combines realistic simulations of both wireless sensor networks and structures. They say it is a promising technology to control the structures based on real-time measurements from wireless sensors attached to the structures so they withstand natural disasters. "The wireless sensor network community has sophisticated mathematical models to simulate these complicated dynamic behaviors of wireless, which have been tested in many environments," Lu said. "The civil engineering community has developed structural models for studying structural dynamics. In our novel approach, we put these two together and integrated the simulation environment into one. We can simulate the physical aspects, or structure dynamics, and cyber aspects, or the dynamics of the wireless communication, in an integrated, holistic fashion." To demonstrate the simulator, the team set up realistic case studies of the integrated wireless control system on a bridge and a building. The case studies are the first high-fidelity, cyber-physical simulations of wireless structural control for large civil structures. 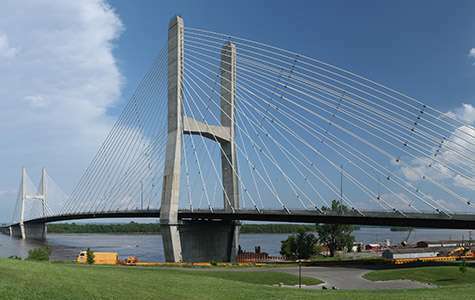 For the bridge case study, they looked at the Bill Emerson Memorial Bridge in Cape Girardeau. The cable-stayed bridge has a main span of 1,150 feet and carries up to 14,000 cars a day over the Mississippi River. Cape Girardeau is in the heart of the New Madrid Seismic Zone, the most active seismic area in the United States east of the Rocky Mountains, encompassing southeastern Missouri, northeastern Arkansas, western Tennessee, western Kentucky and southern Illinois. Because the Cape Girardeau bridge does not have wireless sensors, the researchers used wireless traces collected from a solar-powered, wireless sensor network, deployed by Gul Agha, PhD, professor of computer science, and Bill Spencer, PhD, professor of civil engineering, both at the University of Illinois, on the Jindo Bridge in South Korea, which has similar design and dimensions as the Cape Girardeau bridge. "We took the wireless properties from Jindo and added them to the physical properties of the Cape Girardeau bridge with integrated simulation," Lu said. "The benefit of the cyber-physical simulator is that we can do it virtually." For the building case study, they used a benchmark three-story building model built by Shirley Dyke, PhD, professor of mechanical engineering and civil engineering at Purdue, as well as data from wireless traces from Charles W. Bryan Hall at WUSTL, to create the virtual integration. Lu said the case studies shed light on the challenges of wireless structural control and the limitations of a traditional structural control approach, as well as the promise of a holistic cyber-physical co-design approach to design the wireless control system. "We have built this integrated simulator that captures both the physical and network dynamics that really enable this research for large-scale wireless control systems that could not have been done in high-fidelity in the past," Lu said. "In building this simulator, we hope that it has a long-lasting impact to encourage other researchers to do research in wireless cyber-physical systems." The team expects the research to result in a reduction in the life cycle costs and risks related to U.S. civil infrastructure. The team also plans to disseminate results throughout the international research community through open-source software (wcps.cse.wustl.edu).